The first person to really catch me off guard was a relative of mine who, upon seeing my soon to be son’s picture for the first time in 2011, asked, “What is he?” I wanted to say, “He’s a little boy” just to be smart, but instead I politely answered, “He’s Chinese.” I had never really considered that people who sincerely meant no harm or insult would ask me such questions…and still do in 2018. “Identity” didn’t feature prominently in my life growing up. I am an Italian- American woman who grew up in New Jersey. Pretty standard stuff right there. I was never the minority and had little exposure to different races or cultures until I went to college in the Bronx. Still, not a lot of interaction with or education in Asian cultures. As a kid in the 80’s, our quiet, suburban neighborhood in North Jersey had had an increase of Asian families (or as my father still says, “Oriental”). What I remember most was that the children were studious and played instruments I could never manage to stick with. And they were quiet. My adopted son from China, Nico, is none of those things. Nico is amazing. He is, in every way, his own person. He doesn’t look like the rest of our family – that part we obviously expected, but he also doesn’t act like us. Unlike our biological sons, Nico’s two older brothers, he is not shy. He is not quiet. He is outgoing, self-confident and very mature for his age. He can be annoyingly impulsive, but also full of pure emotion. He cries, laughs and talks audibly in movie theaters. 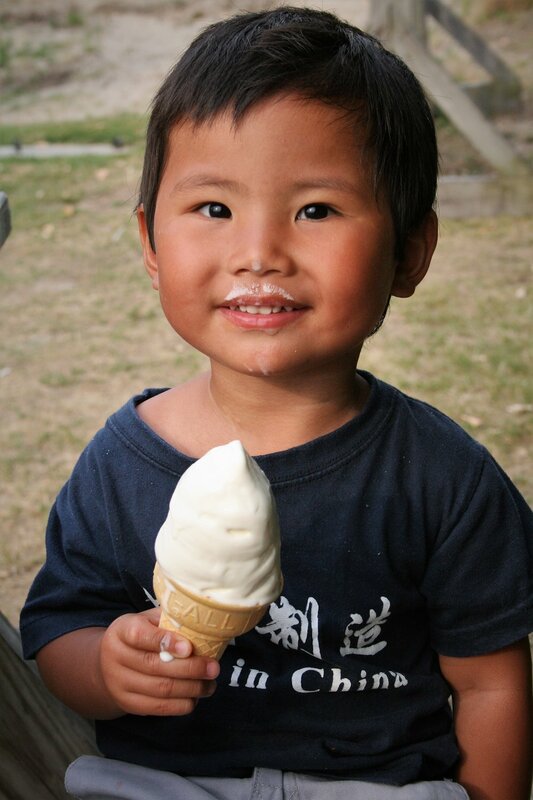 He isn’t the stereotypical (or what I thought was the typical) Asian child in anyway. Math does not hold his attention and he doesn’t play the violin, but he loves to cook and ride his new dirt bike. He wants to be an actor and likes to model. “Being famous” might be his greatest goal, other than to play video games for inordinate amounts of time. We never anticipated this to be his hobby or passion (although in retrospect he did spend a lot of time looking in the mirror as a toddler). His brothers played sports and built with Legos. I realized quickly that I had a son who was different from them, not only his physical appearance and birth history, but in his complete personality. I made the conscious decision to help Nico fulfill his dreams…without a clue as to how to do that. On set for Accountability with co-executive producers Cori Dioquino (far left) and Vanita Kalra (far right) along with fellow actor Mikhayla Dunstan. This piece was written by Nico’s mother, Therese Lynch. Nico and his family are proud members of the Baltimore Asian Pasifika Arts Collective and have been involved in various activities since the organization got its first programs off the ground. Sign up for our Newsletter and be the first to know of what we’re up to next! We want to hear from you! Share with us in the comments below why BAPAC matters to you. Newer PostGrowing Up Filipino in the U.S. The Baltimore Asian Pasifika Arts Collective (BAPAC) is dedicated to strengthening racial understanding between communities and empowering youth through artistic practice and community engagement.